3 oz. (85.049) (0.19) pound) resealable pouch. Bull Durham is one of the most enduring names in American tobacco. 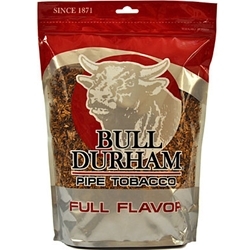 For many years, Bull Durham tobacco products were among the biggest sellers on the market. In fact, the location of ballpark “Bull Durham” signs near where relief pitchers warmed up led to the term “bullpen”. Enjoy an American classic here at Smokers Discounts!